If you are anything like me you probably look at amazing photographs and wonder how the photographer was able to capture it. And as photographers we always want to know what camera settings were used and where any lighting was placed. But there is much more to an amazing image than camera settings and lighting diagrams, the technical aspects of any image; there is also the thought process that went into deciding why a particular subject became the focus of the photographer. Think about one of your own favorite images and ask yourself what it was about the subject that captured your attention and demanded that you photograph it. That is your vision. I’m always curious about the “vision” of other photographers. I do quite a bit of reading on photography both of a technical nature as well as books on developing your own creative vision. So it’s nice to read a book that is a bit outside of those norms. 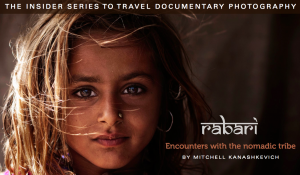 Recently I had the opportunity to review “The Rabari: Encounters with the nomadic tribe” by Mitchell Kanashkevich and part of the Light Stalking guides. Mitchell spent 4 months documenting the nomadic Indian cattle herders called the Rabari through amazing visual imagery. The book highlights 10 images from his work with the Rabari and breaks them down into not only the technical details we all love to see but also the vision behind the image and how he made it all come together. He really answers the question of how was this image made. I love these kinds of books where you get into the head of another photographer and learn the process they went through to create the images. Mitchell is a very talented travel and documentary photographer. I love that he explains in great detail his process in creating these 10 images including camera settings, detailed lighting diagrams as well as the vision behind each image. The guide is structured into 7 sub sections for each image: background information, objectives, light, moment and/or pose, composition, biggest challenge and finally post processing. It’s structured in such a way that it’s easy to follow the thought and process that went into the making of each image. The first part of the book starts with a few words about the project, the main goal being to photograph the Rabari in traditional clothing and rituals. Next is a section about using local guides and how indispensable they can be under many different circumstances. It’s an interesting section on what it takes and what is involved to pull off a project like this. One thing I found really interesting is the equipment that Mitchell used to make these images. It’s so easy to fall into the trap of thinking that high end equipment is necessary for making great images. Mitchell shot this whole project with a Canon 400D, a few prime lenses and a 5-in-1 reflector. More proof that gear is not as important as vision. Finally the book gets to the 10 images and goes into explicit detail for each sub section on how the subject was chosen, why the subject was chosen and how the subject was photographed. I really enjoyed learning about how Mitchell pulled it all off. Sprinkled throughout the book are sections on “quick tips” with advice on things the photographer did and lessons he learned. It’s like you were right there with him as he struggled with different variables and worked through them all. It’s quite fascinating and I learned quite a bit. Between the information on how to light different subjects, the posing and positioning, the composition and what was done post process to create that vision I really felt this book answered the big question of “how was he able to capture that.” If you want to check out some fascinating images of the Rabari people and learn the whole process behind creating each image then you won’t be disappointed with this book. You can purchase The Rabari: Encounters with the nomadic tribe now for $19.95 by using code HAPPYXMAS on checkout. And Light Stalking has a money back guarantee. If you are not happy with your purchase they refund your money. And from now until Christmas everyone who buys a copy of the book will be entered into a drawing to win an iPad 2. Now that would be a very Merry Christmas.